Today’s “Cookie Monday” yields a special treat–Cinnamon Roll Sugar Cookies!!!!! Wait, I think I need one more–! As soon as this recipe from Picky Palate hit my inbox, my heart started pounding. As I scrolled through and the idea settled in, I knew I was a goner. Photo by photo, I watched as Jenny started with a fabulous sugar cookie dough, spread butter over it (! ), sprinkled brown sugar & cinnamon over that (! ), rolled it up, sliced and baked it, then drizzled the cookies with cream cheese icing (!). This is such a creative use of sugar cookie dough and I couldn’t resist the combination of cookies and cinnamon rolls. Seriously, I’m having trouble keeping my cool here. The excitement that these cookies evoke in me makes me want to record a video of me screaming to convey it. It’s not only the concept but the taste!!! I’ve eaten over a dozen and if there were any left after Dennis took them to work, I’d be eating them right now. It’s taking a serious effort not to just write 100 lines of “wheeeeee!” as the entire content of this post prior to the recipe. Wheeeeeeeeeeeeee! Sorry, I couldn’t contain that one. 2. In 2 batches, place in plastic wrap in a disc shape and chill for at least 2 hours for best results. 3. Once chilled, cut each disc into thirds and roll into a 1/8 inch thick oval, about 12 inches X 5 inches on a floured surface. Spread each rolled pieces of dough with 2 Tablespoons softened butter, 1/4 Cup packed brown sugar and 1/4 teaspoon cinnamon. (I forgot to soften my butter beforehand so I just slightly melted it in the microwave and mixed in the brown sugar and cinnamon, then spread it over the dough in a thin layer.) Start rolling from the long end closest to you, rolling into a log shape. (I wrapped the logs in wax paper and refrigerated for another 2 hours at this point because they were too soft to cut and got all smooshed.) Using a sharp knife, cut 1/2 inch pieces of dough then placing onto a silpat or parchment lined baking sheet. Bake at 350 degrees for 9-11 minutes. Remove and let cool for 5 minutes before removing from baking sheet. 4. To prepare frosting, beat the cream cheese until softened and smooth, slowly add powdered sugar and milk until desired consistency. Frost cookies then place in refrigerator until ready to serve. These are 100 times better chilled, trust me!! Posted in Cookies and tagged cinnamon roll, cinnamon roll sugar cookies, Cookies. Bookmark the permalink. Thanks for letting me try it! It was soooooo good. I am def gonna be making this soon. You’re so welcome! I actually still have half the dough left b/c I didn’t have time to make all of it into cinnamon roll cookies or I would have brought half of it into the post office. This recipe makes a ton of cookies! This line makes no sense to me. “12 tablespoons softened butter, (slice 2 Tablespoons 6 times totaling 12 tablespoons)”. Are there 12 TBS total? Yes, 12 total. She’s saying that you should separate in order to have two tablespoons for each of the six parts of dough you will be rolling out. Whoa!! Seriously those look so good!!!!!!!!!!!! These sound amazing! When I am going to find the time to try all of the wonderful recipes you post?! These look incredible! The cream cheese frosting puts them over the top–deliciously. Well goodness! Veronica, this looks fantastic! I could eat a few of these right now! I love the looks of these perfect little gems. Yummy! I am making these saturday! Goodness! These look amazing!!! Bookmarked! Did you just get wet?? Seriously – I’m drooling so much I wouldn’t be surprised if you just got wet! lol! I can’t wait to make these delights! You are so funny, Mel! These sound delicious! I am a huge fan of sugar cookies and cinnamon rolls so a combination of the two is just superb! It’s totally true!!! They are great at room temperature but superb when cold. Keep in mind that these do not actually taste like cinnamon rolls. They taste like soft buttery sugar cookies rolled with cinnamon & sugar with a cream cheese icing. A cross between a cinnamon roll and cookie. I know it’s weird but this is one cookie that is best eaten cold. Oh my heck! These look wonderful! Your dough is probably just too cold–let it sit on the counter for a bit after rolling it out before trying to roll it up. I hope you get it to work, they’re so good! 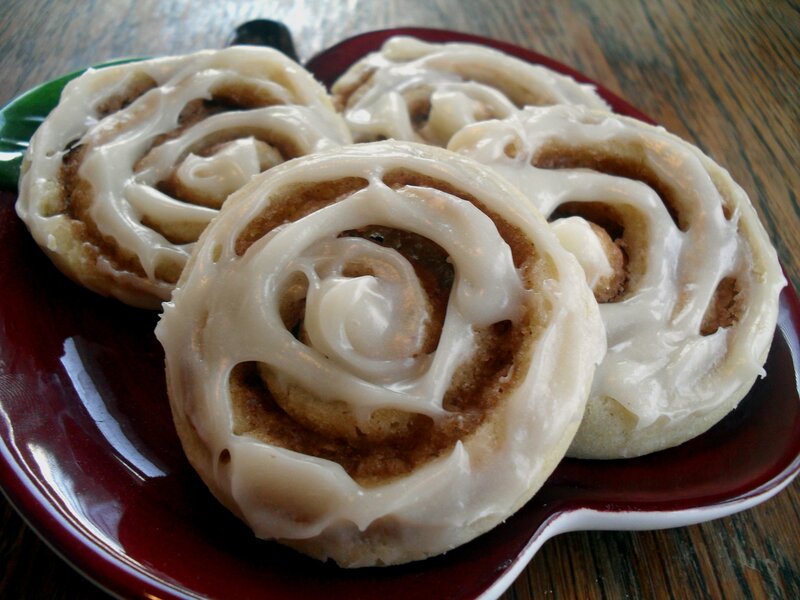 I am going to make these cinnamon roll cookies. I can’t make cinnamon rolls, so I will try these. I would like to enter these in the fair, but will probably be disqualified. This year, I had a few that were DQ’d, but those were in canning. I may have to add sugar sprinkles to remind them these are sugar cookies! yeah, they are a little questionable as far as sugar cookies go…I’m trying to remember which category I entered them into. OH! It wasn’t sugar cookies. It was refrigerator cookies – like the ones where you have to refrigerate the dough. They are less likely to get disqualified from that if your fair has that category.